We’re just on the brink of the ‘hungry gap’ at the moment; that point in the year when last year’s produce has nearly run out and this year’s crops have yet to get going, so there will be little in the way of home-grown veg over the coming weeks. However, we’ve still got a good supply of pumpkins (the ‘Crown Prince’ variety stores excellently) and chillies (those I didn’t freeze, I left to dry in a bowl on the kitchen windowsill), so here’s a quick and easy recipe combining these two lovely flavours. I make a lot of soup in the winter and this is one of my favourites, firstly, because we always seem to have an abundance of pumpkins and secondly, because it’s the season of sniffles and this recipe contains my holy trinity of cold-fighting ingredients: onions and garlic (with their anti-inflammatory, antibacterial and anti-viral powers) and chilli (packed with vitamin C and an excellent decongestant). It’s also bright and cheerful to look at, perfect for dark February days. Heat the oil in the pan and add the onion, garlic and chilli. Fry over a medium heat for a few minutes until the onions are translucent. 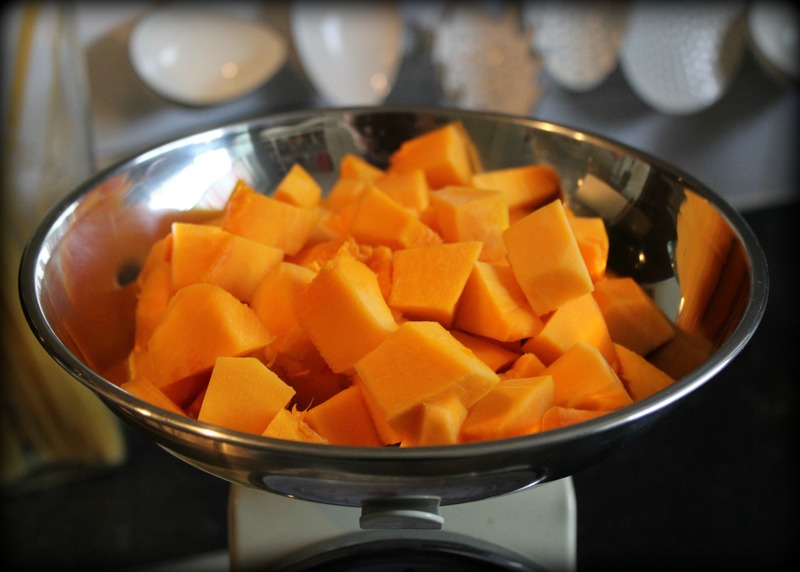 Turn up the heat and add the diced pumpkin. Cook for 3 mins, stirring regularly. Add the vegetable stock and bring to the boil before turning down the heat and simmering for 20 mins. Season with salt before blending. 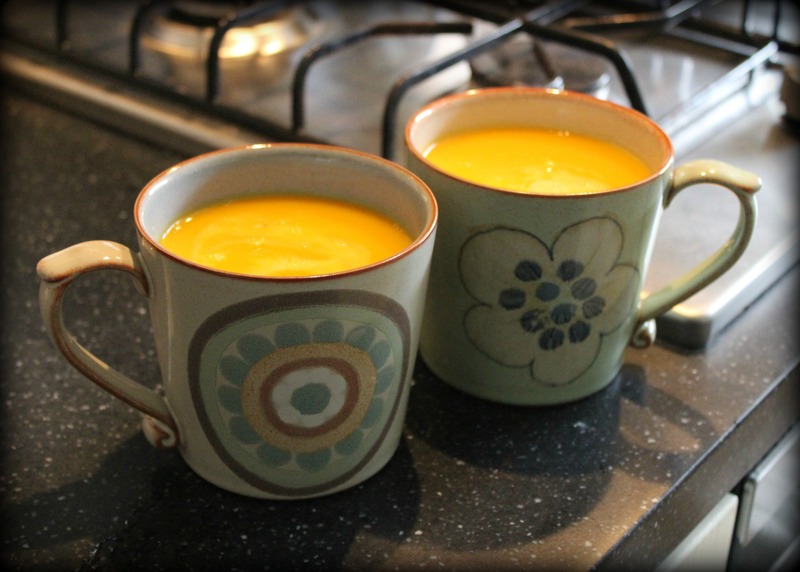 Great soup for lunch on the allotment – I haven’t perfected storing pumpkin and squash – Ive been debating putting them in the loft). Where do you store yours? We just keep ours in a corner of the kitchen. It can sometimes get quite steamy in there, but Crown Prince pumpkins are great for storing – ours are still looking good and we harvested them back in October! I’ll look into grown prince and give them a go. Sounds delicious. Good inspiration just when I was thinking I need to make more soups to make a dent in my stock supply! I did something similar a few times with some galangal and red curry paste added to give it a Thai kick. Hungry gap on my plot too. The wind ripped the covers off the purple sprouting broccoli and my sprouts and the birds ate the emerging produce. I’m sure soup would be the perfect place for it! How are you thinking of using it? If it’s pureed already it might be good in a pie? I’m using it in cake. It does actually taste quite unpleasant to my mind in anything but cake. The other pumpkin I grew last year, with flesh more like a butternut squash than a marrow was really tasty, so this year I’m growing those exclusively. Hello Agents! May I reblog this one? Will translate then 😉 Looks delicious!! !